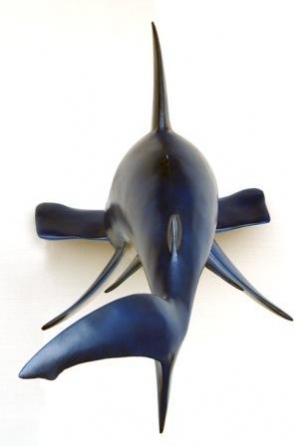 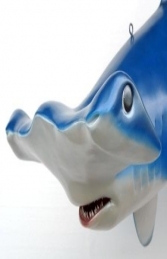 This superb model of a Hammerhead Shark is 8ft long, and is ideal for any marine, oceanic, surfing or beach themed area, advertising or drawing attention to your nautical, surf or diving shop or business, or even your own home. This impressive model of a swimming Hammerhead Shark looks wonderful hung from the ceiling, especially in combination with our smaller Hammerhead (JR 2460) and our other shark models, to give a real underwater feel to any marine themed area. 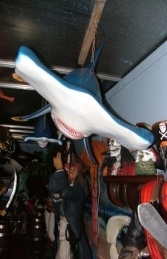 These models have been used all over the country in lots of different ways; from customers who wanted to theme up their indoor swimming pools at home, to theme parks and aquariums.